DOT’s proposal for a bike lane on Bay Ridge Parkway, which would have preserved all travel lanes and parking, was scrapped after local politicians blasted the concept and Brooklyn Community Board 10 voted against it, 32-8, in May 2011. At the time, the future looked bleak for bike lanes in Bay Ridge. Instead of simply saying “no,” however, the community board is back, proposing its own bike lane routes to DOT that cover more mileage than DOT’s original proposal. Following a 6-1 vote by its transportation committee in June, the community board voted 40-2 on Monday to send a list of potential streets for bike lanes to DOT. The streets include Sixth Avenue, 68th Street from Sixth Avenue to Shore Road, 72nd Street from Shore Road to Sixth Avenue, Marine Avenue and 11th Avenue. “There will be more bike lanes in Bay Ridge and Dyker Heights, no matter what,” said transportation committee Chair Brian Kieran. While CB 10’s vote is only advisory and does not guarantee that DOT will install bike lanes at the recommended locations, the request itself represents a significant shift from the board’s confrontational past with the agency. When DOT first proposed bike lanes, many board members felt the plan was “written in stone,” said CB 10 member Bob HuDock. “The view of DOT down here is that DOT is kind of the enemy,” he said. 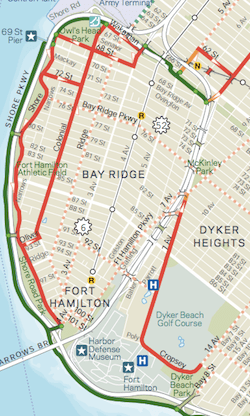 Many neighborhood residents were not happy with DOT’s proposal for bike lanes along Bay Ridge Parkway, Third Avenue, Fort Hamilton Parkway and 92nd Street because, they said, they didn’t want cyclists being directed to high-traffic streets. After DOT’s original proposal was voted down last year, board member Judith Grimaldi made a motion to ask CB 10’s transportation committee to suggest alternate bike lane routes to DOT. Minutes after DOT’s plan failed, Grimaldi’s motion passed. In the months that followed, it took a lot of work to change minds and ensure the issue got attention. “There was a big education process,” HuDock said, “proving to people that this was not some frivolous issue. A lot of people in this community rely on bicycles for transportation.” That work paid off with June’s transportation committee vote and this week’s full board vote in support of bike lanes. This is really good news. I’m glad to hear that the CB is talking logically about creating a network that actually links to places, instead of a piecemeal approach. Bay RIdge would be a great place to try a Bicycle Boulevard in NYC. Several of the low volume streets in the plan won’t get anything more than sharrows without removing parking, but could be great candidates for a bike boulevard. I’d love to see this tried on 11th Ave, which would create a major 2 mile backbone for a low-stress network in the Dycker Heights/Borough Park area. A few well-placed diverters and speed bumps would preserve local access and parking, but would make the street very resident and bike friendly by discouraging high speeds and through traffic. For as far as we’ve come, I find it curious that bike boulevards have never been tried in NYC. What’s really incredible here is the success brought about by the tenacious activists of Southern Brooklyn T.A. Volunteer Committee. When the going gets tough, the tough keep going (to meetings for years). And with patience, persistence, and reason, Bob Hudock, Gene Aronowitz, and others found success when many of us thought this part of Brooklyn might remain a bike lane desert for years. Congrats all around, and here’s to the beginning of a robust bike network in South Brooklyn! This is a great development; and, yes cyclists on high-traffic streets may cause more problems and risk but, also elevate the status of cycling as would protected lanes on 5th and 6th Avenues in Manhattan. Lanes on low-traffic streets seem to be much safer. It’s about time to seriously consider elevated veloways that follow the city’s waterways coordinated with Vision 2020 and the Economic Development Council (EDC) as it would greatly improve tourism and safe transportation around the city at minimal cost.